These Phantoms were taxiing towards me from the ramp and they headed out to depart. As the came along the taxiway, I got a moment as they started to merge from my position and, briefly, there was a moment when one was hidden behind the other with the exception of the wings. For that second I had a Phantom bi-plane in front of me before the effect was gone. I consider this the rare Phantom II/IV! 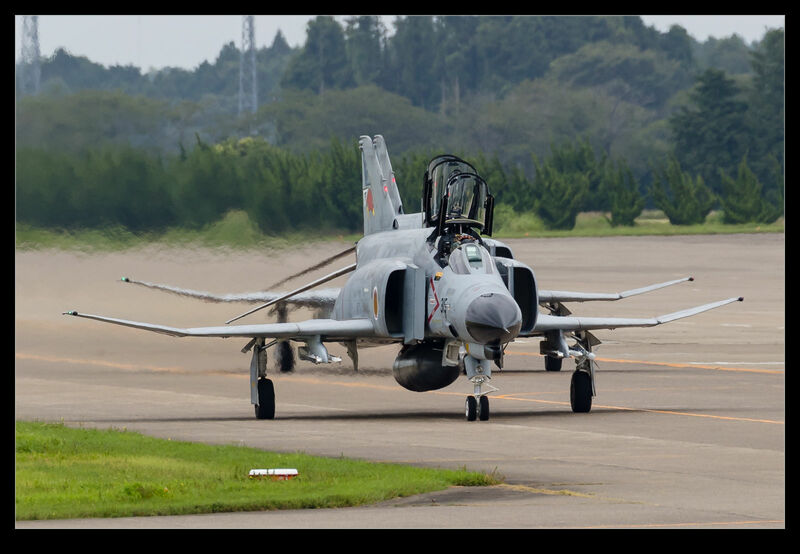 This entry was posted in aircraft, military, photo, Travel and tagged aircraft, airplane, Douglas, f-4ej, fighter, hyakuri, ibaraki, Japan, jasdf, jet, McDonnell, military, phantom, photo, taxi. Bookmark the permalink.